People sometimes ask if our dog, Jet, is a Border Collie and we often reply that she is a “Mock Border Collie”, the people we bought her from were named Mock. 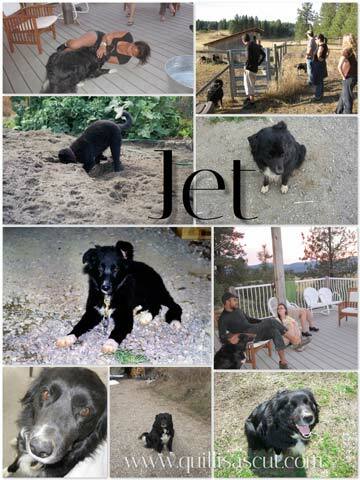 Jet’s parents lived and work on a cattle ranch, they both looked true to the breed, but I think there may have been some hanky-panky going on with mom and a midnight visitor. All of you who have helped feed the poultry on our farm have seen her tendencies and display of bird dog instincts. Although, her number one obsession is cats. She might be helping hold the goats back at the garden gate and her eyes begin to drift towards a kitten over by the water bucket. Will she follow her pursuit or stick with keeping back the persistent goats? Jet is the most outgoing dog on our farm. When new visitors arrive she is the first to greet them, she won’t rest until each person has been acknowledged, sitting at their feet waiting for a pat on the head or a few kind words.